The First Street Federal Building was listed in 1985 on the National Register of Historic Places as a contributing structure within the Mandan Commercial Historic District. The structure was built in 1915 as a U.S. Post Office and was occupied as such until the new post office was constructed and opened in 1962. Ownership of the building was later transferred to the City of Mandan and housed the city's library from 1964 until 2003. 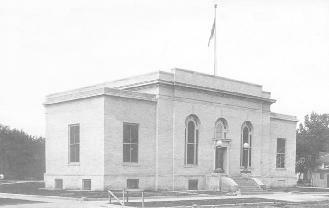 The First Street Federal Building was designed by James Knox Taylor, FAIA, Supervising Architect (1897-1912) of the US Treasury Department and was designed and constructed concurrently with a similar but slightly smaller building in Wahpeton, ND. Taylor became known as the "National Architect" due to the improved character of designs and construction of buildings during his 15-year tenure. By the end of his Federal career, the US Treasury commissioned an average of 10 buildings a month nationwide. James Knox Taylor was involved in the construction of more than 800 federal buildings, thus creating a clearly recognizable, strong federal image across the country. His successor Oscar Wenderoth supervised its construction and commissioning. Taylor worked to harmonize his architecture with local history, climate and environment. He specified native North Dakotan brick for the building manufactured locally. Although smaller and less ornate than other examples of period Federal buildings, the main floor elevation was carefully proportioned to create a dignified and solid character incorporating features such as iron lamps, recessed windows, and elegant archways. Its formal composition relies on the unity of parts, scale, symmetry, rhythm and classical ornamentation for its architectural effect. The National Geodetic Survey (NGS) selected this "massive structure" to hold an elevation benchmark in 1931. The survey marker was described as being "installed near the southwest corner of the building on the south wall approximately five feet above the surface." A 1982 NGS survey team was unable to locate it. A bush hid it and the building's cornerstone from view. However a more likely explanation is the team was at the current post office two blocks away. The NGS database was updated in 2007 to report the marker in "good" condition. 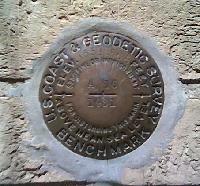 It's outer ring contains the text "US COAST & GEODETIC SURVEY BENCHMARK" The second ring states "ELEV 1651.368 FEET ABOVE MEAN SEA LEVEL" and its inner ring states "$250 FINE OR IMPRISIONMENT FOR DISTURBING THIS MARKER." In 1962, the US Postal Service constructed a new post office, and the building was turned over to the city's library district. To that point in time, the city's library was housed since 1939 in the basement of the World War Memorial Building (today's City Hall). After remodeling, the building served in this new role until 2004 when the library was moved to the NP Freight House on West Main Street. The city did accept proposals to purchase for the building in 2003. However since remediation of the ground oil plume beneath the downtown area had not started, interested was limited. The city left the building vacant and unheated, angering activists attempting to save the building to claim the city was purposely assuring its "demolition by neglect." It was demolished in January 2008 to make way for additional senior housing.